Residents living in some of Manchester's gun crime hotspots are getting first aid training to use at the scenes of shootings. Red Cross officials are due to give lessons on basic first aid in Moss Side and Hulme on Tuesday. The aim is to give them the skills to treat gun victims in the vital few minutes before emergency crews arrive. It is hoped the initiative will help raise awareness about the threat of gun crime in inner-city communities. At the end of the course those trained will be given badges to wear and posters to display in their windows, so they are easily identifiable as trained first aiders. Manchester City Council, which supports the scheme, hope it will encourage people to work together to tackle gun crime. The first of four courses starts on Tuesday, with 12 people in each course, but a few places are still available. Lindsay Wong, a support worker from the Moss Side-based DASH/Positive Futures, said: "We will be targeting ordinary people from those communities most affected by gun crime who will be willing to help out. "They will be given basic first-aid training and be made readily identifiable, so that in the event of an emergency people know where to turn. "Ambulances often have to wait until the police have ensured an area is safe before they can go to the scene, but if we can provide medical attention in those first few minutes after a shooting, that could ultimately be the difference between someone surviving and not surviving." A Greater Manchester Police spokeswoman said: "We approve of anything that helps to save lives. "The first few minutes are vital for the victim and if people are trained to help then we support that." Funding for the scheme came from one of the government-funded "Community Chests" through Voluntary Action Manchester, an agency offering support to voluntary groups. Community chests are set up throughout the country as part of the government's neighbourhood renewal strategy. Gun crime: Has anything changed? 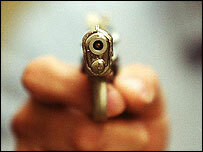 1Xtra: Gun first aiders - good idea?